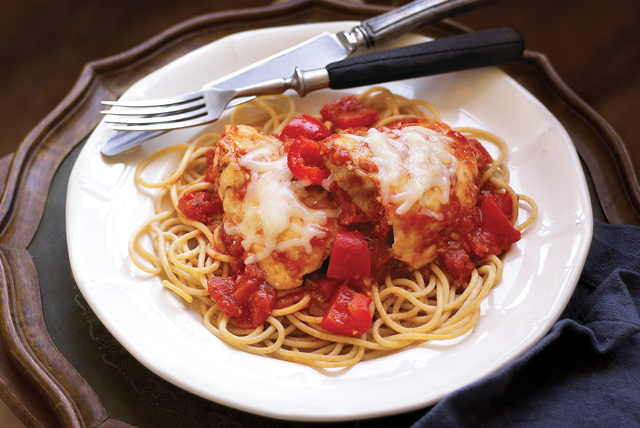 Quick-cooking chicken thighs are tender in no time, saucy and cheesy and served with pasta. Scrumptious, low-fat and low-cal. Stir in next 4 ingredients; cover. Simmer on medium-low heat 20 min. or until chicken is done (165°F), stirring occasionally. Meanwhile, cook spaghetti as directed on package, omitting salt. Drain spaghetti; place on platter. Top with chicken mixture. Add 1/4 cup sliced black olives along with the peppers, tomatoes, tomato paste and garlic. Since chicken thighs do not need long slow cooking times in order to tenderize them, they are more practical for quick weeknight dinners than other budget meat cuts.